Prospects for Passage of USMCA? 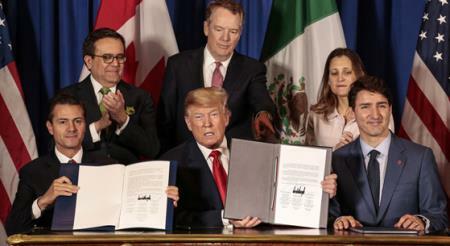 Despite the publicity accorded the signing ceremony for the USMCA during the G-20 Summit, none of the three nations involved have presented the Agreement to their respective legislatures for ratification. Given the composition of the House, prospects for passage without changes and concessions appear dim. In the event that Congress does not approve the USMCA, the White House has threatened to unilaterally withdraw from NAFTA. In a recent editorial, The Wall Street Journal expressed the view that prominent legislators including Sherrod Brown (D-OH) and Rep Tim Ryan (D-OH) consider that the USMCA provides insufficient protection for U.S. workers. U.S. Trade Representative Robert Lighthizer pushed for higher wages for a proportion of workers in Mexico producing automobiles for the U.S. market. This was intended to placate Democratic members of the House and Senate who have since become emboldened to oppose the USMCA. The conservative credentials of The Wall Street Journal are without question as a pro-business publication. They characterize a unilateral withdrawal from NAFTA as "political suicide" for the party in power unless there are sufficient votes to ratify USMCA. CHICK-NEWS and EGG-NEWS have consistently stressed the importance of exports to both Canada and Mexico, without which prices and hence profitability of poultry would be eroded in the domestic market resulting in curtailed production and shuttered plants. As with many contentious issues which have surfaced in the past two years, it is hoped that reason will prevail and that a workable compromise will emerge. This will contribute to harmonious relations with our northern and southern neighbors to the benefit of the agricultural sector and specifically egg, turkey and broiler production.